Posted by thetickthatbitme in Treatment. Have you ever stored a frying pan with a plastic handle in your oven and then forgotten it was in there the next time you turned the oven on? If you have, you probably can’t use that frying pan anymore because the handle is melted off. That’s a situation that demonstrates why it’s important to use products the way the manufacturer intended. Think about how many over-the-counter medications you might have in your medicine cabinet. They all have different purposes, right? Some are for pain, others are for allergies, and others are for cough and cold. You bought each medication for a specific purpose, and it won’t work for other purposes. For example, you wouldn’t take Zyrtec if your back hurts, just like you wouldn’t take Ibuprofen in the hopes that you’ll stop sneezing when you go outside. You also have to follow the correct dosing and timing specified by the manufacturer. If your back ache is going to last for the next 10 hours, and the instructions say you can take two pills every 4 hours, you can’t just take 4 pills now in order to save time. If you’re a daredevil, you’re probably thinking to yourself, “Oh, that’s no big deal. I won’t die,” and you’re right, you probably won’t die from taking 4 Ibuprofen when you’re only supposed to take two. But if you failed to follow the manufacturer’s instructions every time you took Ibuprofen, and you took it every day for months, you would probably be doing some serious damage to your body. Now let’s think about a prescription antibiotic called Ceftriaxone (or Rocephin). Ceftriaxone is used for IV therapy to treat a variety of infections, including Borrelia burgdorferi (Lyme Disease) and Borrelia hermsii (Tick-borne Relapsing Fever). The drug comes in a powder form, and it has to be dissolved (“reconstituted” is the official term) in a sterile solution before it goes into your IV. By the time most patients see the drug, it has already been reconstituted in solution inside an IV bag by a doctor or pharmacist. This means the patients have never seen the vial that the drug came in, and they certainly haven’t seen the package insert and read the instructions. So why should you care what’s in the package insert? Isn’t that for your doctor to worry about? Wouldn’t a doctor who has treated hundreds of Borrelia infections know the right way to prepare and use Ceftriaxone? See if you can answer those questions when you’re finished reading this post. Shelf life. Depending on how it is stored, Ceftriaxone in solution may have anywhere from zero to ten days of shelf-life. There are two main variables that influence the length of shelf-life: what the solution is made of and what container it’s stored in. As you can see from the table below, Ceftriaxone can be reconstituted in a variety of sterile solutions. What’s in the solution determines how it should be stored and for how long. For example, Ceftriaxone in a solution of Dextrose and Sodium Chloride cannot be refrigerated, and it only keeps for 2 days. Containers. 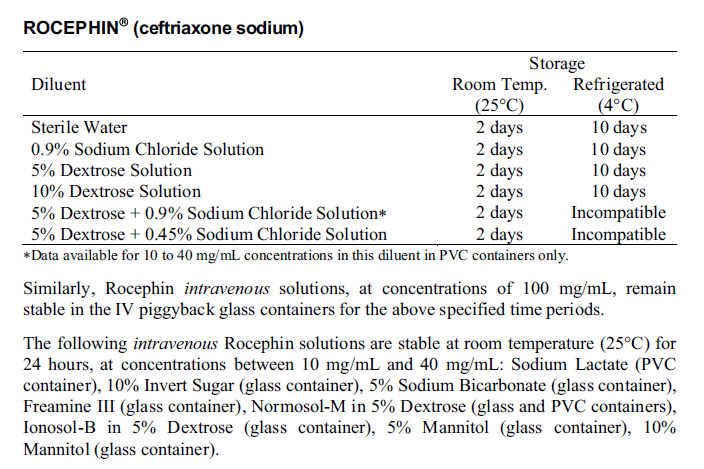 Take a look at the above excerpt from the Rocephin/Ceftriaxone package insert. The only two types of containers it references are glass and PVC. Why? Because those are the only two types of containers in which Roche, the manufacturer, has studied the drug. They don’t know what happens to Ceftriaxone in solution if you store it in a container made of any other material. So the next question is: Are doctors and pharmacists only storing reconstituted Ceftriaxone in PVC and glass? Okay, with the glass, I’m actually not surprised. I’ve seen a good number of YouTube videos featuring patients doing home infusions, and in none of them did I see any glass containers. But what about PVC? Oh wait, PVC! I know you! PVC is an acronym for polyvinyl chloride, a substance used to make all kinds of things from pipes to IV bags and tubes. The problem with PVC is that it contains phthalates, specifically one called Di-2-ethylhexyl phthalate (DEHP). Exposure to DEHP and other phthalates has been linked to all sorts of health problems, and it has been banned in the manufacture of toys in both the U.S. (2008) and the European Union (1999). More recently, Kaiser Permanente announced that it will no longer buy IV medical equipment made with PVC or DEHP, and other hospitals have followed suit. Maybe that’s because they read this study about how DEHP leached out of PVC bags containing lipid emulsions (a.k.a. liquid nutrition), or this study about how DEHP leeched into saline stored in PVC bags, or any of the other 50+ studies on TOXNET about PVC and infusions. Taking these developments into consideration, if you’re doing home infusions with Ceftriaxone, your doctor or pharmacist probably isn’t storing the reconstituted Ceftriaxone in PVC containers—and if s/he is, s/he shouldn’t be! Moreover, since we don’t know anything about the shelf-life of Ceftriaxone in any other types of containers (besides glass), it’s probably not a good idea to store it in non-PVC containers either. What about storing it in IV bags or syringes? I asked Dr. W about this, and he said that these containers are not intended for storage. IV bags even say, “Single use container. When introducing additives, do not store.” Again, there is NO DATA on how well this drug stores in syringes and non-PVC IV bags. “So what about glass,” you say. “Should I just ask my doctor to put the reconstituted Ceftriaxone in a glass container?” Well, glass is a better choice than PVC or some other container, and some solutions, like Dextrose, are still available in glass bottles, but if those bottles get even one little crack, you’re S.O.L. Another concern is that even when stored correctly for the amount of time allotted by the manufacturer, Ceftriaxone can lose up to 10% of its potency, which means that if you are using drug that was made up yesterday or a week ago, some of the drug that’s going into your system is inactive. I’ve heard reports of stored Ceftriaxone turning yellow after a few days in the fridge. Dr. W explained that this is a very bad sign, because a color change means a chemical change has occurred. (Think about what happens when the bread sitting on your counter turns blue.) I don’t know what the effects of inactive drug going into your system are, but I think ideally, you want the drug to be 100% active, which means you want the drug to be freshly prepared daily, if possible. I know this is a tall order for both patients and doctors, but I think that doctors who really care about treating their patients effectively should consider this approach. Not only does it make the most sense, but it’s also the way the manufacturer intended for the drug to be administered. Read below. Notice how they say that in order to “minimize drug waste,” that is, to keep the drug from going bad, it should be “mixed at bedside just prior to administration.” This means they want your doctor to fix it up right before you get your infusion. Note the use of “rare” in the next sentence. It should be RARE that the drug is not infused right after it’s prepared. Instead, most doctors seem to be making up drug a week in advance and telling patients to pop it in the fridge with last night’s leftover spaghetti. No, don’t eat that hamburger meat that’s been in the fridge for a week, but if you want to infuse that week-old Ceftriaxone solution, go right on ahead. Here’s where my YouTube favorites list really started to play like a horror movie. (Cue Hitchcock music.) I saw all sorts of scary things in addition to the violation of the don’t-store-in-anything-but-glass rule. I saw a little girl hold her PICC line tube in her mouth while she flushed it with saline. (Yeah, Mom, it’s great that she could do it all by herself, but do you really think that’s be best way to keep the line clean?) I saw a young woman in Australia reconstitute her own Ceftriaxone on her living room coffee table. Most disturbing, I saw patients giving themselves Ceftriaxone through PICC lines using a technique called “IV push.” Why did this scare me? Allow me to explain. An IV push is when a syringe containing reconstituted drug is hooked up to the PICC line and pushed through in just a few minutes. It’s a method that seems, to me, to be favored by lazy nurses who don’t have 30 minutes to wait around while a home care patient gets a drip. Aside from being a lazy method, is it a dangerous method to use with Ceftriaxone? Of course. 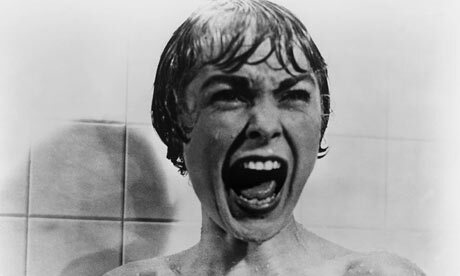 Why do you think it scares me so much! To see why it’s dangerous, you have to understand the manufacturer’s instructions for appropriate concentrations of the drug and for the timing of drug delivery. Concentration concerns. 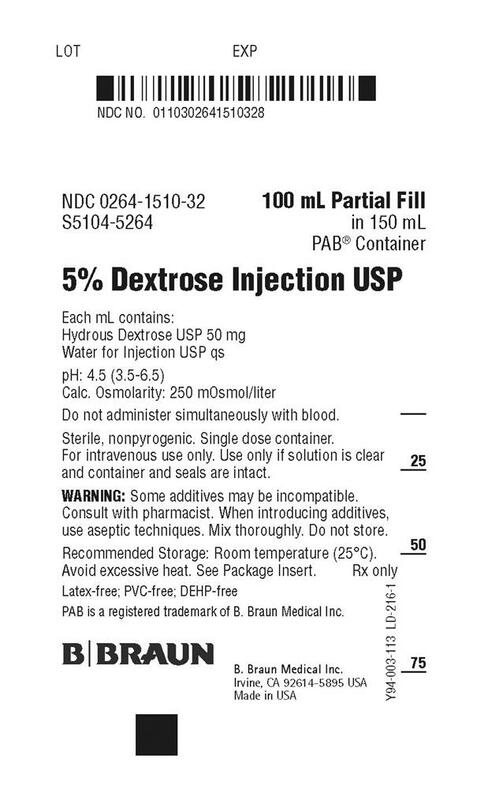 According to the package insert, 40 mg/mL is the maximum concentration allowed for Ceftriaxone. If you are infusing 2 grams Ceftriaxone, you need to dissolve it in at least 50 mL of solution (2 g = 2000 mg; 2000/40 = 50). Last time I checked, 50 mL of solution doesn’t fit in a little syringe. If you use less than 50 mL of solution, you can’t be sure that all of the drug (which is in powder form) dissolves, and that’s bad because you don’t want powder going into your vein. Even if you do manage to dissolve all of the drug in less than 50 mL of solution, there’s no guarantee that it will stay dissolved in that high concentration. Remember, syringes aren’t made for storage, and the drug company hasn’t studied the shelf-life of Ceftriaxone stored in syringes. Timing concerns. Ceftriaxone is meant to be infused, not injected into your vein. That means it’s supposed to drip slowly. In our fast-paced society, I know it’s tempting to want to speed things up. Some of my fellow patients in the infusion clinic were always trying to speed up their IVs behind the doctor’s back so they could get out of there faster, and when they were caught, they were strongly admonished for two reasons. First, the drug is most effective when infused slowly. Second, infusing a drug too quickly can cause dangerous adverse reactions. So imagine you’re doing a three-minute IV push through a PICC line. That means you’re putting the drug into your system ten times faster than it’s supposed to go in. What will happen is that you’ll have a very high concentration of the drug in your blood stream, and then you’ll have quick fall-off. This can result in high toxicity if the drug precipitates to your gallbladder or kidneys. The result is that you might experience a gallbladder attack or even kidney failure. What’s worse is that since you are pushing the drug through a PICC line and not through a little vein in your hand, you’re putting the drug into a vein that goes directly to your heart. If it hits your heart too quickly, you could give yourself an arrhythmia or bradycardia. The bottom line: Any doctor or nurse who wants to give you an IV push with Ceftriaxone clearly hasn’t read and understood the manufacturer’s instructions in the package insert and should not be considered competent to treat you with IV therapy. Many doctors aren’t using Ceftriaxone (Rocephin) according to manufacturer instructions. Ceftriaxone has no proven shelf-life when stored in anything besides PVC and glass. PVC is dangerous and should not be used to store any drug you plan on putting in your body. Glass storage containers can crack and leak. Ceftriaxone MUST be dissolved in AT LEAST 50 mL of solution. Anything less is unstable and unsafe. Ceftriaxone in solution must NOT be stored in IV bags and syringes. Daily prepared Ceftriaxone is the only sure way to get stable and potent drug. Ceftriaxone must be infused over at least 30 minutes in order to be safe and effective. IV push is a dangerous method that poses serious risks to the patient, including complications affecting the gall bladder, kidneys, and heart. Questions? Concerns? Crazy Ceftriaxone stories? I await your comments.